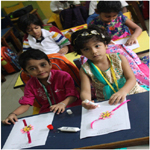 Preprimary celebrated farm day with the students’. They came dressed up in their favourite animals like lion, rabbit, and octopus. They spoke few sentences about their Favourite character. 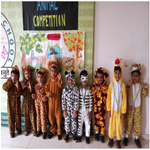 The competition helped in giving valuable knowledge on various species of wild life. 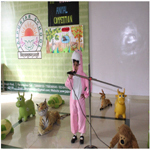 The program was a fruitful step for spreading awareness amongst the students about animals. 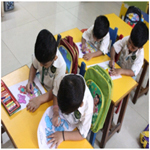 They learnt about different animals in a playful method. 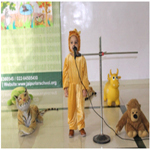 Teachers dressed up like different wild and domestic animals and students enjoyed the show. It was full of energy. 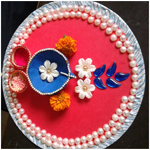 As Navaratri celebrations begin this month, an inter-class poojathali decoration competition was held in Jaipuriar School, Sanpada. 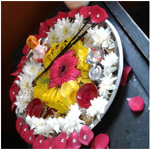 For auspicious occasions, the pooja thali was tastefully decorated with flowers, sindoor, diya and other items. 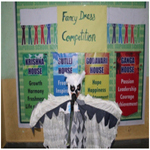 Students from classes I-IX enthusiastically participated in this competition. 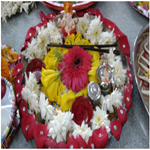 Students were at their artistic best with tastefully decorated thalis complete with flowers, sindoor, diya, prasad, small replicas of gods and goddesses. 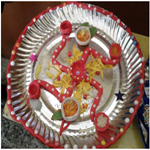 Some of the students went the eco-friendly way in decorating their thalisusing clay and leaves used C.Ds, paper plates, etc. 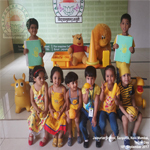 Pre-primary celebrated yellow day. All the students and teachers came to school in pretty yellow colour dress. 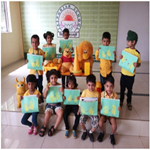 Special assembly was conducted and students recited the rhymes on yellow colour.Various activities were conducted like palm printing, bird makingetc. The students spend the day with utmost enjoyment. Students from STD 7 to 10 participated in Football Carnival with walkathon organised by NMMC at Karave along with teachers .It was awonderful experience for the students and teachers. The 15th State Level Wushu Championship was held at the Indoor Sports Complex, Nagpur from the 9th to the 12thof September. 10 students participated from Jaipuriar School, Sanpada, Navi Mumbai .Students of Jaipuriar School have consistently performed well in the Wushu Championships .Aryan Vallam of Class VII and Manasi Sinha of Class VIII won the gold medal. Hisham Khan of Class VIII and Kripa Bagul of Class VIII won the silver medal. 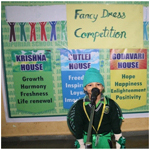 Yukta Singh of Class IV and Vedant Singh of Class VI won the bronze medal. 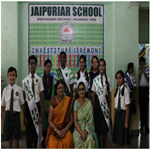 In the over-all medal tally, the Juniors of Jaipuriar School bagged the third position. Students who won gold and silver medals will now represent the school at the national level which will be held in Gujarat.” It’s a moment of great pride and joy for us. I wish all the best to my students for Nationals “Principal Aarti Singh added. The Constitution of India adopted Hindi in Devanagri Script as the official language of the Union under Article (343) in 1950. Hindi Diwas is celebrated every year on 14th September to pay tribute to the official language of India. Hindi Diwas was celebrated with great enthusiasm in Jaipuriar School. 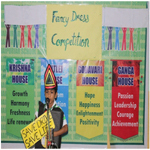 Various competitions were held as a part of the celebrations. 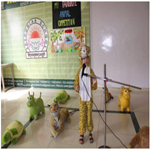 In the Primary section, a story telling competition was held for classes I-III and a story writing competition was held for classes IV & V. In the Secondary section, an extempore competition was held for classes VI-X. 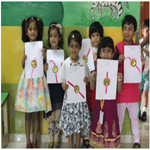 Students participated enthusiastically and spoke eloquently on the different topics in Hindi. Chris Morris from XI D under 19 category bagged Ist position in weight lifting competition held at Mahanagarpalika School Sec 14 Nerul and selected for division. Yash Dekhmukh from XI C selected as top 4 players in Table Tennis held at Father Agnel School and selected for division. 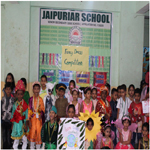 Traditional Dress Competition:Unity in Diversity, the students wore traditional costumes that represented various Indian States. 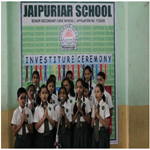 On 17th July, 2017 Investiture Ceremony was held in Jaipuriar School. Mrs. Jyotsana Bhatnagar was our Chief Guest. Undersigned, Co-ordinatorswere also present in the function. 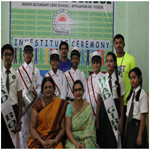 Students of grade V to IX along with their teachers witnessed the function. We started the function with a prayer,GuruVandana. Secondary Co-ordinator welcomed the chief guest and our principal Pre-primary coordinator honoured them. After the welcome note our chief guest was requested to pin the badges and adorn the sashes on Senior Head boy, Deputy Head boy, Senior Head girl and Deputy Head girl. Undersigned conferred the badges and the sashes to the captains and vice captains of this year. After that our PE Sir took ceremony to the newly elected members of the student council. Senior Head boy and Senior Head girl gave their speeches respectively. Our Chief Guest gave a motivational speech to encourage the students as well. The program was come to an end with thevote of thanks from coordinator.